Little did "Onima" know how her life was about to be changed forever the day she ventured out after the boishakhi storm in search of the luscious green mangoes. The setting was none other than Shantiniketan and that day, by a stroke of fate, she caught the eye of Kobi Guru Rabindranath Tagore. Since her childhood, Onima, nicknamed Mohor was brought up and educated in the serene atmosphere of Rabindranath's Ashram, at Shantiniketan. Even at her tender age, no one failed to realise that she was gifted with an inimitable voice. Later on, the world would know her by a different name, a name lovingly christened by Rabindranath after one of his poetry books - "Kanika". Kanika Bandyopadhyay, the legendary singer of Rabindra Sangeet, was born in Bankura in the year 1924. From that day at the orchard, a special bond started to develop between Rabindranath and her. For well over the next 50 years, she immersed herself completely in music and in the rich artistic surroundings of the Ashram. Among her teachers were stalwarts such as Dinendranath Tagore, Indira Devi Chowdhurani, Sailajaranjan Majumdar and Santidev Ghosh. But most importantly, she was one of the rare protegees to come under the tutelage of the Gurudeb himself; she blossomed under his training and guidance. Many of the leading artistes of Bangladesh, such as Papya Sarwar, Rezwana Chowdhury Bonnya, Sadi Mohammad, Aminur Rahman Nijhu and Lilly Islam had the rare experience of training under Konika at Shantiniketan. 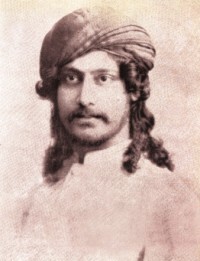 "Shantiniketan had many great artistes as tutors who had been the direct disciples of Tagore, such as Arati Basu, Subinoy Ray, Nimai Chand Boral, Nilima Sen, Alok Chattopadhyay and of course Kanika Bandyopadhyay. The guru-parampara method of teaching was followed exactly as they were taught by Tagore himself," says Bonnya. "It was like a dream come true," says a wide-eyed Lilly. In 1981, when Lilly joined the diploma course she didn't initially get the opportunity to train under Kanika. Fortunately at her second year, she was chosen in a group of 10, to perform at Durdarshan TV of Kolkata; it was then that she trained under Kanika. "We often used to have classes at her house. As she sat on a chair, we would gather all around her on the ground. She always started by explaining the background of the song, and even in her simple dialogue one could sense how passionately she felt about music. Even when we failed to sing the proper notes, she had always a word of praise for us. She would say, that our voice was similar to the sarengi notes and that we should try to be more accurate, " says Lilly. In the world of music she was royalty. "We would watch in awe as she would enter the campus. Her personality, her bearing all bore an unmistakable regality. On the other hand, she was modest to a fault. When we requested her to teach us a particular song, she would unhesitatingly suggest Bachchu di (Nilima Sen) who in her words sang the song `better'!" "There was so much more to learn from these stalwarts besides music," says Sadi. The most fascinating thing about her was that no one had ever heard her practice songs. "Mohor di would always be humming a tune. That was her unique style of rewaz. That way she could be one with her music at all time," asserts Lilly. Little wonder that Rabindranath specially wrote songs for Konika to perform including Keno Noyon Apni Bheshey Jai, for the play Tasher Desh. Kanika had come to Dhaka for the first time in 1956. She visited Dhaka at least twice after Liberation. When she came in 1972, she was quite unwell and was not able to continue for long. With only the snow-white Rojonigondha on her hair, she was an image from the Golden Age of music, as the packed hall listened enthralled. We listened to her renditions of Durey kothaye durey durey, Roop shagore dub diyechi, Aami rupey tomay bholabo na, Anondo dhara bohichey bhuboney and many more. To her, songs were nothing short of "offerings". "I have learnt so much from nature all around us, and I always try to be completely attuned with it" Kanika would often say. From that fateful day in the mango grove to the day Kanika breathed her last, she maintained this philosophy. She not only performed Rabindra Sangeet, she surrounded herself in its lyrical beauty. And in doing so, she presented the world a glimpse of her majestic art, her priceless "offering" to posterity.